Garage door springs are generally installed in pairs on either side of the door and function to keep it supported, well-balanced, and safe to use. Due to the pressure under which they constantly operate, springs can fail without warning. This can make the door difficult to operate, may cause it to sag, or even come off of its bracket to ensure that your springs are performing as they should, contact one of our technicians for assistance in having them installed, replaced, repaired or maintained. Whether you need extension or overhead garage door springs, we are able to source a wide range of products that are perfect for your needs. If you require a more support strength or resistance against the elements, you can opt for a galvanized or oil tempered spring for your setup. 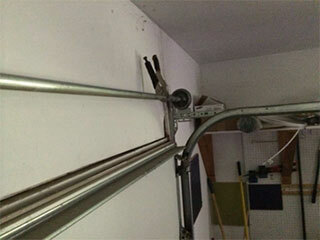 Maintaining your springs is essential for ensuring the safety and functionality of your garage door. That is why we provide thorough inspections for signs of warping, cracking or stress damage to determine whether you will soon be faced with a broken garage door spring or not. With regular inspections and upkeep, we can spot a problem and deal with it before it affects your entire door. Our team also offers overhead and extension spring repair services, which will restore your springs to operational order without the need for replacements. Where minor damage has occurred from slight rust, pressure or corrosion, our technicians are able restore them leaving you with high quality springs once again. Our technicians have extensive combined experience in the field of garage door springs, so if you are having trouble with yours, or it has been some time since you have seen to their upkeep, why not give a consultant at Overhead Garage Door Minneapolis a call for further information on our services?